As Batman marks his 80th anniversary in comics and entertainment, you’d have to imagine he’s proud of all he’s achieved (if Batman were one to allow himself to feel something so self-congratulatory as pride). Bruce Wayne may have intended his costume to strike terror into the hearts of criminals, but it’s done something far more powerful within those of us who don’t live outside the law—it’s captured our hearts and minds. Since his debut, Batman has transcended the realm of comics to become one of the most popular and enduring characters in all of entertainment. He’s graced the large screen and small numerous times, in movies, TV, animation and video games. We’ve seen the Dark Knight’s face and logo on t-shirts, hoodies, shoes, hats, leggings and just about every other article of clothing imaginable. He’s inspired toys—from free fast food giveaways to high-end collectibles—and has shown up on nearly every product imaginable. Batman’s been the subject of documentary films, college studies and art shows. He’s inspired memes, comedy sketches and parodies. He’s launched his own unofficial holiday and inspired thousands of cosplayers worldwide. Batman’s transcended his role of a superhero. He’s now part of our shared culture and awareness. People know who Batman is, no matter their age and interests, and regardless of whether or not they follow comics or super-powered heroes. And yet, this remarkable, unrivaled eighty-year journey began so simply. In 1939, DC Comics was looking for a new superhero—a character who could build on the wild success of their earlier comic book phenomenon, Superman. Editor Vin Sullivan turned to what then appeared to be an unlikely creative source, gag cartoonist Bob Kane, and asked him to design a new hero. Bob Kane along with writer Bill Finger would go on to conceive one of the most popular and enduring characters of the twentieth century—the Batman. The very first Batman story, “The Case of the Chemical Syndicate,” was written by Finger and drawn by Kane. It was published in Detective Comics #27, which hit newsstands on March 30, 1939 (cover date: May 1939). In his first story, Batman was introduced as uninteresting socialite Bruce Wayne. Donning his iconic costume, he became a merciless crimefighter who dispatched hoodlums with grim satisfaction. “A fitting end for his kind,” Batman announced after knocking a criminal into a vat of acid. It was a markedly different Caped Crusader than the one we know now—a noir-tinged, street level do-gooder who was more than willing to get his hands dirty in the interest of the greater good. But even in this earliest story, which is only six pages long, his mind for justice was present, as was his secret identity, unknown to his good friend Commissioner Gordon, who also makes his debut here. Detective Comics #27, despite being continually reprinted, continues to be one of the most highly sought comics among collectors and fans. A copy of Detective Comics #27 sold for $1.07 million in 2010. In 1939, it sold for ten cents, but it moved enough copies to merit more stories featuring the grey-and-black crimefighter. Batman utilized his utility belt for the first time to store glass pellets filled with gas in Detective Comics #29 (July 1939). The first boomerang-like batarang and the first bat-themed vehicle—the Bat-Gyro, which has a helicopter blade—made their debuts in Detective Comics #31 (September 1939). 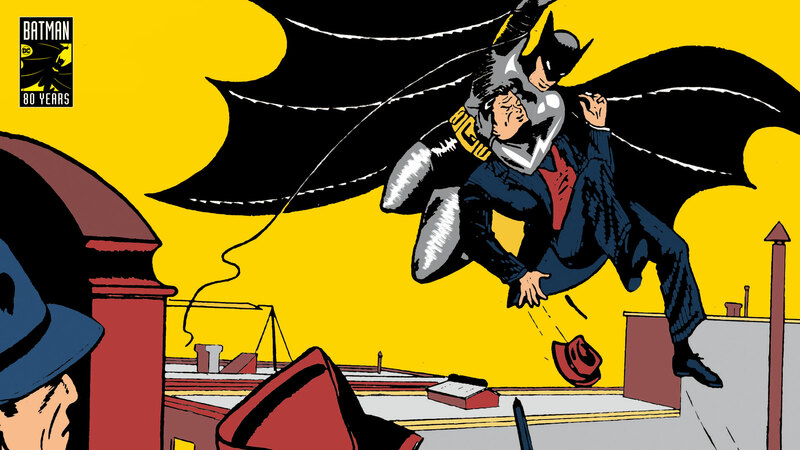 The Bat-Gyro was replaced by the Batplane, which first appeared in Batman #1 (March 1940). Batman’s tragic origin story, in which a mugger guns down Bruce Wayne’s parents as the family walks home from a movie, was introduced six months after the hero’s debut, in Detective Comics #33 (November 1939). This seemingly simple origin would continue to be explored and mined for emotional depth for decades to come. Look for more on Batman’s long history of heroics tomorrow as part of DC’s Batman 80th anniversary celebration.